85 days. Capsicum annuum. Open Pollinated. Plant produces good yields of 3" long by 1 ½" wide hot peppers. 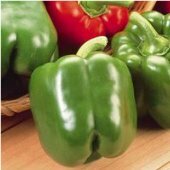 Peppers are mild, have very thick walls, and turn from green to red when mature. Plant has green stems, green leaves, and white flowers. Excellent for pizza and pickling. A variety from the USA. 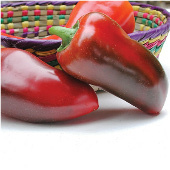 Some hot pepper varieties come from tropical humid regions and some varieties come from dry desert regions. The temperature, moisture, and air circulation all play a role in growing plants from seeds. Too little heat, too much moisture, and lack of air circulation will cause poor results. Do not use jiffy peat pots, plugs, or potting soil as the soil becomes too dry or too wet, which can lead to disease and fungus. We have experienced disease and low germination when using these types of products. Use Miracle Gro Seed Starting Material for best germination results. Read the Hot Pepper Growing Tips and Planting Instructions for information on growing hot peppers from seeds. Please take time to watch the Hot Pepper Planting Instructions Movie . Plants can grow 1 to 7 ft tall. 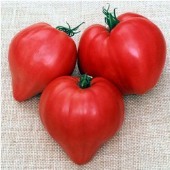 Requires fertile soil in a well drained location in the garden. Apply much and grass clippings, or straw around base of plant. Water well with soaker hoses during dry and hot spells. Harvest hot peppers when they are fully mature using a garden scissor so you don't damage the plant. Pick peppers as they mature to encourage new buds to form. Grew these last year. 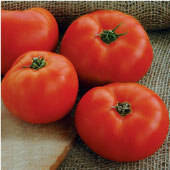 Thick walled, little sweet, little heat and were terrific fresh on pizza.